My thanks to Bron for hosting this event. Hopefully Clare will soon be fit enough to return to normal blogging and the round up of Event #3 , Chequerboard cookies. Here are my two entries. Peel and slice pear and place in acidulated water until ready to use. 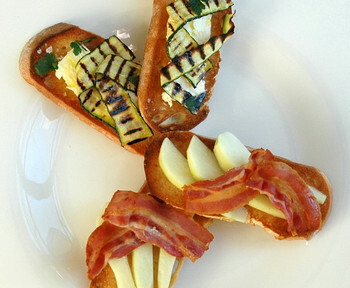 Dry pear slices on a paper towel and layer on toasted bread slices. 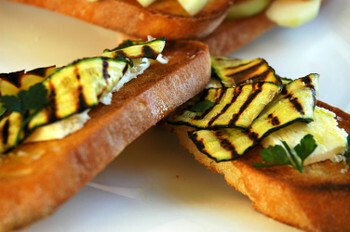 Brush zucchini slices with oil and grill on both sides. 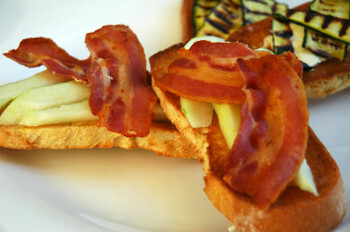 Layer sliced fetta on toasted bread and top with zucchini slices. Drizzle with a little olive oil and sprinkle with salt. Check back with Bron Marshall for her round up next week. I'm looking forward to seeing Donna at the Auckland Food Show on Thursday.